The Yokogawa Electric Corporation has announced the release of the TDLS8000 tunable diode laser spectrometer. 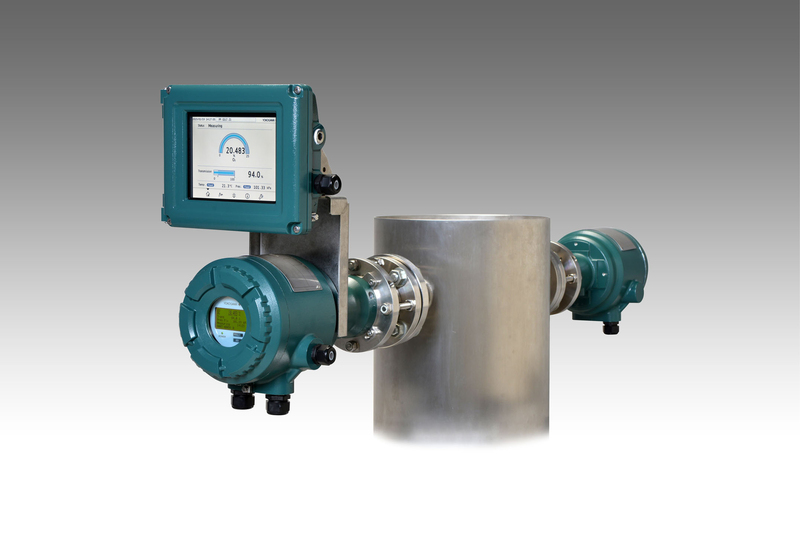 This new product can quickly make in-situ measurements of gas concentrations in combustion and heating processes that are employed in the oil, petrochemical, electric power, iron and steel, and other industries, allowing quick and efficient combustion control. Yokogawa’s laser gas analyser instruments make use of tunable diode laser spectroscopy (TDLS) to measure the gas concentration. To make the measurement, a receiving unit detects how much energy is absorbed as a laser beam, tuned to the correct absorption frequency of the gas to be monitored, is transmitted through the duct carrying the mixed gas stream. With this technique, there is no need for a sampling device: the analyser can be installed directly on a gas duct and make measurements quickly, in real time. Yokogawa’s analysers use a unique spectrum area method whereby the gas concentration is calculated based on the area in an absorption-distribution chart, and thus can stably measure the concentration of a specific gas in the presence of other gases or dust and under conditions where the temperature and/or pressure is fluctuating. Companies are always looking for ways to optimise processes by saving energy, reducing CO2 emissions, and improving safety. An important way to do this is by optimising the air-fuel ratio in the combustion process. To accomplish this, sensors are needed that can continuously monitor the concentration of Oxygen and both Carbon Monoxide and Methane from the fuel in the radiant section of fired heaters. The Yokogawa TDLS200 laser gas analyser, originally released in 2008, is an instrument capable of quickly performing in-situ measurements of the concentration of the near-infrared absorbing (paramagnetic) gases such as O2, CO, CO2, and NH3. Since the launch of this innovative product seven years ago, its high accuracy and precision have earned it a good reputation in the marketplace, and the TDLS200 has become one of the best-selling instruments of its type in the global market (admittedly based on market surveys conducted by Yokogawa). The TDLS8000 is being introduced as the successor to the TDLS200 to satisfy the need for improved operability and to allow for greater adaptability in difficult applications. The TDLS8000’s laser module includes a newly developed reference cell board that improves the reliability of absorption peak detection, which is an important step in the spectral area method. In addition, the receiving unit employs a new auto gain function that can automatically optimise detection sensitivity depending on the measurement object. By increasing the signal-to-noise ratio (S/N ratio), this improves the reliability of measurements taken in coal combustion and other processes where there is high particulate loading. Designed to meet the requirements for SIL2 certification (certification pending) defined by the International Electrotechnical Commission (IEC), the TDLS8000 will play a key support role in ensuring the safe operation of plants. The TDLS8000 comes with a large 7.5-inch LCD touch screen that can display a greater variety of data. The touch screen replaces the push button interface used with preceding models, making the setting of parameters easier and more intuitive. The light source module containing the laser diode is fully sealed and damage resistant. To facilitate troubleshooting and reduce downtime, this module is able to store up to 50 days’ worth of raw data that can be accessed anywhere in the world by, for example, a Yokogawa response centre. The new design of the TDLS8000 unit is just three-quarters the size and weight of the preceding model, allowing it to be installed in a greater variety of locations. As the successor to the TDLS200 laser gas analyser, the TDLS8000 offers improved reliability and operability. With this new product, Yokogawa aims to capture a greater share of the gas analyser market by offering a solution that will make it possible to improve plant efficiency and safety. Major target markets include industries such as oil and gas, petrochemicals, chemicals, electric power, iron and steel, and ceramics. Applications include measurement of O2 concentration in fired heaters for improved safety and lifecycle management; measurement of the Carbon Monoxide concentration during the combustion process; measurement of the amount of moisture in hydrocarbons and corrosive gases; and measurement of ammonia concentration for leak detection during the DeNox process. Yokogawa plan to certify the TDLS8000 to the IECEx, ATEX (Europe), FM (US), cFM (Canada), and TIIS (Japan) explosion-proof standards. It will be suitable for installation in hazardous areas that require the use of an explosion-proof enclosure. After two decades serving the Colombian market, Endress+Hauser is acquiring 100 percent of its longtime sales and service partner in Bogotà, the process automation business of Colsein Ltda. “We believe Colombia represents a market with great potential for further growth,” explains Michael Ziesemer, Chief Operating Officer of the Endress+Hauser Group. To date, the Swiss measurement and process automation specialist has been represented by local partner Colsein Ltda, whose portfolio includes a wide range of services such as calibration, maintenance and engineering, in addition to its sales activities. To gain additional market share and fortify the Endress+Hauser brand even further in the country, Colsein’s process automation business will be transferred to a new Endress+Hauser sales subsidiary on 1 January 2016. The company will continue to maintain its headquarters in the capital city of Bogotà. Gabriel Navas, founder and managing director of Colsein, will continue as a member of the board. With a population of almost 50 million, Colombia is one of South America’s most populated countries, second only to Brazil. After Chile, it is considered the continent’s largest growth market. Although the oil and gas industry is the main driver of economic development, state-of-the-art measurement and automation technology is also helping to make process technologies efficient, safe and environmentally compatible in the food & beverage, water & wastewater and power & energy industries. With the Optisonic 8300, Krohne presents a dedicated ultrasonic flowmeter for the measurement of superheated steam. The 2-beam flowmeter stands out with a measuring accuracy of 1%, high repeatability, and a large dynamic measuring range. Typical applications include boiler and plant efficiency monitoring in power plants, energy balancing or inter-company steam billing. As downtime of steam pipes is very costly and must be avoided, Optisonic 8300 was built for long term use: it features a full bore flow sensor without moving parts or obstructions, and an overall sturdy and robust construction with no cables or sensitive parts exposed. Therefore, it can uphold its measuring accuracy without maintenance or subsequent calibration for up to 20 years, while keeping operating costs at a minimum. If verification of the measuring accuracy should become necessary, it can be provided by using the flowmeter diagnostics, without removing the flowmeter. With nominal sizes ranging from DN 100 to 1000, or 4” to 40″, Optisonic 8300 is particularly suited to high flow rates. Pressure rating up to 200 bar (3625 psi) and temperature rating up to 540°C / 1004°F are available, higher requirements can be considered on request. With temperature and pressure sensors also connected to the device, the integrated flow computer can calculate steam mass flow. Optisonic 8300 adds to the Krohne portfolio of ultrasonic process and custody transfer meters for liquids and gases, which now cover the range from compressed air to cryogenic liquid natural gas (LNG). 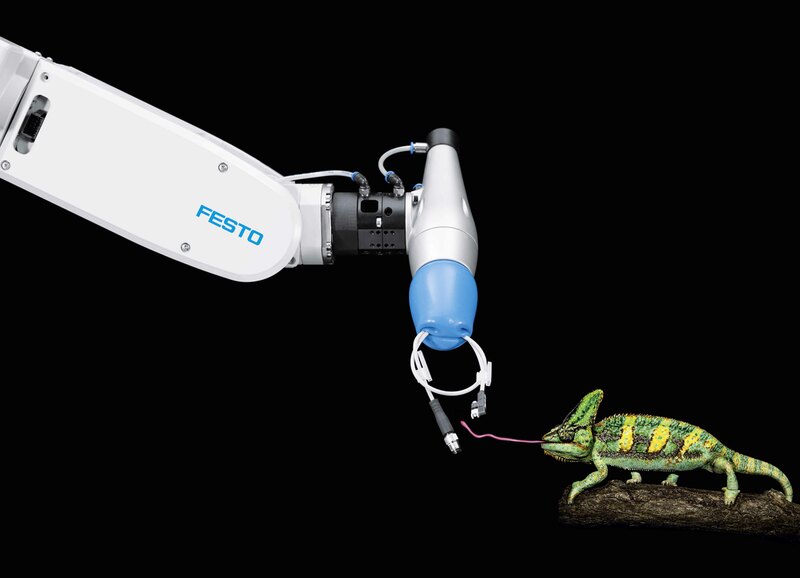 Festo has announced three new additions to its ‘inspired by nature’ range; BionicANTS, eMotionButterflies and the FlexShapeGripper. The latest creations from Festo’s Bionic Learning Network play towards the philosophy of Industry 4.0. This year’s approach has been to investigate ways to “join the network”, to review the connectivity in production through communication. The BionicANTs and eMotionButterflies illustrate how through combining individual systems, a single system of networked communications can be created. In addition, the FlexShapeGripper demonstrates how a flexible and adaptable gripping mechanism, which is based on a reptile’s natural feeding habit, can be used across a wide range of applications. The BionicANTs project focuses on cooperation and looks at how ants autonomously work together for one common solution. 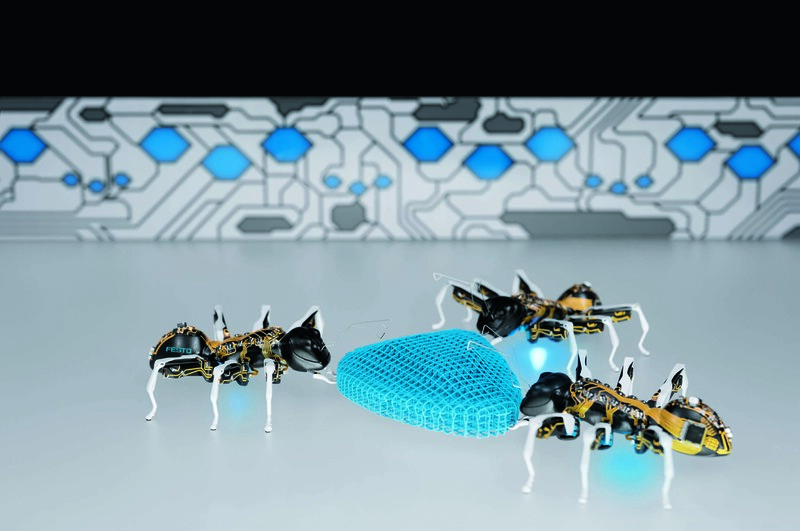 For the BionicANTs, Festo’s engineers have not only taken the delicate anatomy of the natural ant as a role model. For the first time, the cooperative behaviour of the creatures has also been transferred to the world of technology using complex control algorithms. The cooperative behaviour of ants provides interesting approaches for the factory of tomorrow. Future production systems will be founded on intelligent components, which adapt flexibly to different production scenarios and thus take on tasks from a higher control level. Gripping applications have always played a key role in production. In cooperation with University of Oslo, Festo is now presenting a gripper whose working principle is derived from the tongue of a chameleon. The FlexShapeGripper can pick up, gather and put down several objects with the widest range of shapes in one procedure, without the need for manual conversion. The unique ability to adapt to many different shapes is made possible by its water-filled silicone cap, which wraps itself around any item being picked up in a flexible and form-fitting manner. “We see the FlexShapeGripper being used in any facility where multiple objects with a range of different shapes are handled at the same time. For example within the robotics sector, for assembly tasks or when handling small parts,” commented Frontzek. 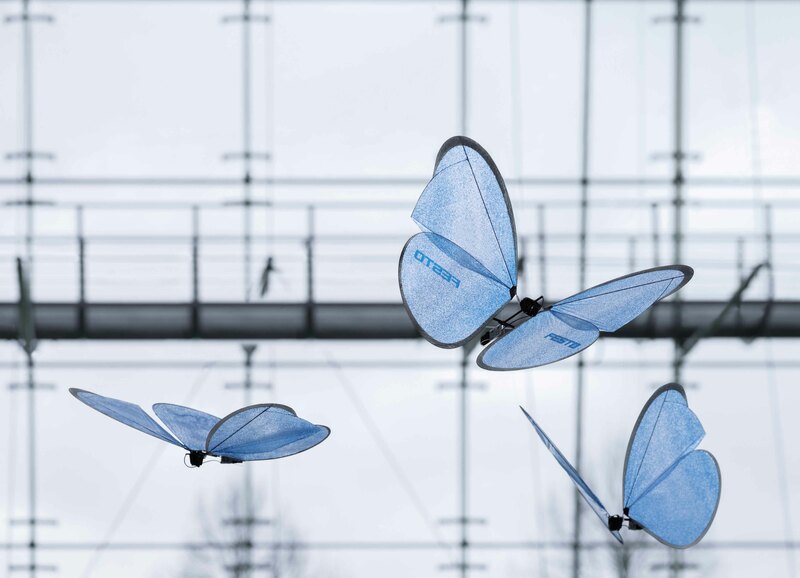 Festo’s eMotionButterflies have been developed to solve complex issues such as functional integration, ultra-lightweight construction and communication between individual systems that are networked and optimised on a real-time basis. The bionic butterflies show the extent to which the virtual and real world can work together. Coordination between the individual flying objects is possible due to a well-networked external guidance and monitoring system. The communication and sensor technology used, which creates an indoor GPS system, enables the butterflies to display collective behaviour without any danger of collision. The combination of integrated electronics and external camera technology, used with a host computer, ensures process stability through an intelligent guidance and monitoring system. This technology opens up possibilities for enhanced safety of applications in an industrial environment. To download further information about BionicANTS, FlexShapeGripper and eMotionButterflies, visit www.festo.com/bionics. 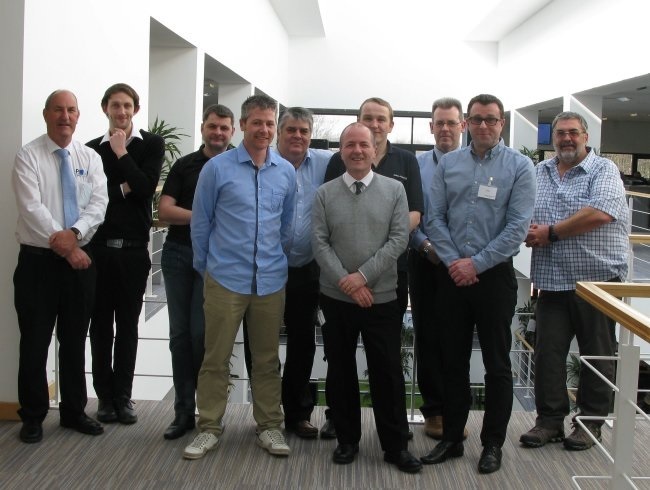 The first group of engineers to pass the newly accredited UK Certified Profibus System Design course have graduated. The course was delivered by Verwer Training and Consultancy (VTC) at the extensive Endress+Hauser training centre in Manchester, where the picture below was taken. The graduates include engineers from Endress+Hauser, Trant Engineering, CAT E&I and Control Specialists Ltd: Andy Verwer, of VTC, is on the left. The intensive course covered the detailed design of Profibus systems including methods for dealing with hazardous environments, various speed and performance requirements and solutions for high reliability and availability. One of the core aims of this training is to cover the various methods of optimising control system design so that the impact of control system failures and maintenance on production is minimised. The course is suitable for engineers who are involved in the specification, design and procurement of Profibus systems and covers many of the key concepts in achieving a reliable, repairable and maintainable system. The course is particularly valuable for companies involved in the UK water industry, where the WIMES standards apply. The course can be cost effectively delivered on-site for between 4 and 20 people. See the Certified Profibus System Design course web page for more information. You can also call VTC to chat over your requirements. This annual two-day conference is taking place in Stratford-on-Avon on 23 & 24 June in 2015. It includes two parallel streams of activities involving hands-on practical workshops and in-depth presentations by industry experts. The event will be covering the latest developments in Profibus and Profinet – it is also suitable for those who are new to the technology, who want to see the equipment working and talk to users who have installed systems already. Equipment manufacturers will show products and systems in an associated exhibition. VTC will be represented by Andy Verwer who will be making a presentation on Profibus and Profinet system design and running a hands-on Profibus workshop. Peter Thomas, another of the VTC trainers, will be running a Profinet diagnostics workshop. Dennis van Booma, the CEO of ProCentec in the Netherlands, will be talking about network monitoring and diagnostics and presenting the latest ProCentec products for use on site. See the conference programme for more details. If registering, please mention VTC in the comments box! VTC are offering two free places on the Certified Profibus Installer course and Certified Profibus System Designer course at the conference. Winners will be drawn from the conference attendees, during the event. In a separate news item, PI (Profibus and Profinet International) is celebrating its 25th Anniversary, and has released the latest node counts for installed systems: over 50 million Profibus and 10 million Profinet devices have been installed. PI say that the growth in numbers of installed Profinet systems has been in line with the forecasts of an ARC market study of trends in Ethernet-based systems, which stated that the growth of Profinet was expected to exceed that of its competitors and the general Industrial Ethernet market. This PI claims is because Profinet is the only standard that combines the strict real-time requirements of high-performance machines (using higher-level systems such as MOM – Manufacturing Operation Management) with the necessary openness for IP communication. But what about Profibus, and Profisafe for that matter, in process industry applications? So the PI emphasis seems to be on developing Profinet into the process automation industry, possibly even displacing Profibus.